If you're in the market for a new mobile phone in 2018, you really are spoilt for choice – excellent top-tier handsets from the likes of Apple, Google and Samsung are now being joined by very decent cheaper alternatives, including the OnePlus 6 and Nokia 8 Sirocco. Those two phones are the ones we'll focus on here, both looking to undercut the big names with flagship-quality specs and design at mid-range prices. But where is your money best spent? We'll compare the two phones in all the categories that matter. Both the OnePlus 6 and the Nokia 8 Sirocco ooze style, though to our eyes the OnePlus phone just edges it – maybe it's the ultra-thin bezels around the display at the front, or even the notch, but it looks more modern than the Nokia (and to be fair, it was launched three months later). The OnePlus 6 is a bigger phone, boasting a 6.28-inch OLED display and a 1080 x 2280 pixel resolution (around 402 pixels-per-inch). The glass front and back are trimmed with aluminium, and you can pick it up in matte black, glossy black, red and white. With the Nokia 8 Sirocco, you've got yourself a smaller 5.5-inch OLED screen but a sharper 1440 x 2560 pixel resolution (that's 534 ppi). Again it's glass front and back, this time with a stainless steel edge, and the phone is only available in black. We really can't fault either manufacturer as far as the looks of the phone go, though as we've said we do slightly prefer the aesthetics of the OnePlus model. Whichever phone you opt for, it's certainly going to attract plenty of admiring glances whenever you take it out of your pocket. In the specs department, the OnePlus 6 is the more powerful phone with the more modern components – a reminder that the Sirocco model is essentially a minor bump to the Nokia 8 smartphone that first launched in August 2017. That originally phone was still an impressive handset, but its internal components are now starting to show their age. With the OnePlus 6 you've got a Snapdragon 845 chipset, 6GB or 8GB of RAM, and 64GB, 128GB or 256GB of internal storage space (with no memory card slot for expanding that). Availability varies by country, but whichever set of specs you decide to opt for, that's plenty of power – it's difficult to find a smartphone on the market at the moment that can better those specs. The Nokia 8 Sirocco, meanwhile, brings with it a Snapdragon 835 chipset, and a single configuration: 6GB of RAM and 128GB of storage. Again, there's no memory card slot, so you can't expand on that. While the processor is a step down from the one inside the OnePlus 6, it was cutting edge in 2017, and is still able to keep the Nokia 8 Sirocco feeling speedy and responsive. In this department the OnePlus 6 has the edge, thanks mainly to that newer Snapdragon chip powering everything. It also comes packing a slightly bigger battery, though the power draw on the larger screen is probably enough to cancel that out. Of course you'll want to know about the rear-facing cameras on these devices: the OnePlus 6 carries a dual-lens 16MP+20MP snapper while the Nokia 8 Sirocco has a dual-lens 12MP+13MP camera – too close to call on paper really. In our reviews of the phones we found they were both capable of getting some very impressive results, so you shouldn't have anything to worry about as far as photos and videos go. Neither phone can boast the IP68 water and dustproofing protection that usually indicates that a phone can take a dunk in the drink and survive to tell the tale. However, both phones offer some kind of fast charging technology, but only the Nokia model has wireless charging – you have to make do with a cable with the OnePlus 6. Both phones have rear fingerprint scanners, and with a USB-C slot handling charging and data transfer duties. If you've got an older pair of wired headphones that you want to keep using, maybe the OnePlus 6 is the better option – it retains the traditional 3.5mm audio jack, whereas the Nokia 8 Sirocco does away with it (you need to use Bluetooth, or a dongle, or USB-C headphones). As far as the software goes, the Nokia 8 Sirocco uses a pure, near-stock version of Android, very close to what you'll find on Google's own phones. The OnePlus 6 comes with OnePlus' own OxygenOS software on board – it's based on stock Android, but it has some rather neat design flourishes, as well as a few other tweaks. Hopefully our admiration for both these phones has come through during the course of the article: they're undoubtedly two of the best Android handsets on the market right now, and neither one is going to let you down. The OnePlus 6 gives you more screen space, but the Nokia 8 Sirocco has a higher resolution; the Nokia 8 Sirocco gives you the flexibility of wireless charging, whereas the OnePlus 6 brings with it a bigger battery. 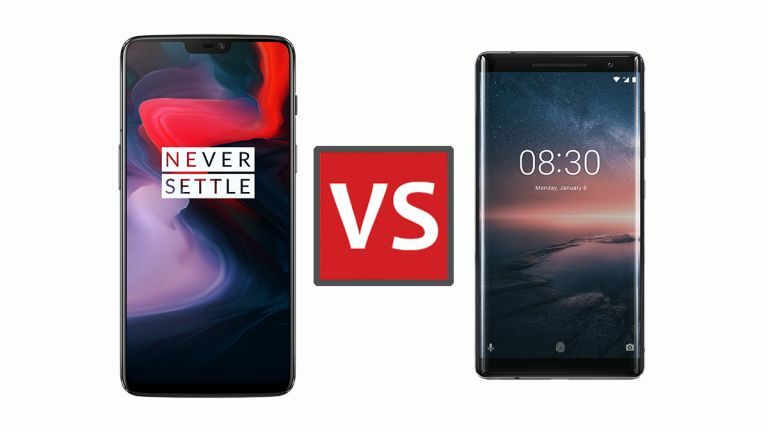 In a lot of ways it's hard to split these two phones – you might just want to decide which one you like the design of most, or which you can find at a better price (they should be both in a similar sort of bracket at the moment). As we've mentioned, the Nokia 8 Sirocco is based largely on a 2017 phone, and the newer components in the OnePlus 6 do give it a slight edge. We also like the more modern looks of the OnePlus handset, and the company has done a good job on its OxygenOS software (though you'll probably be waiting longer for updates than you will on the Nokia phone). Bear in mind what's coming down the line too. Nokia is widely expected to launch a new flagship phone before 2018, while OnePlus might also unveil another "T" series model to give a slight bump to the OnePlus 6. That's not to say you shouldn't put off making a purchase now – but bear it in mind.